We can use File - Print Preview for either quickly printing the contents of the active window or as a means of quickly creating a layout using the window. The File - Print Preview menu command appears for visual windows such as maps, drawings, images and labels. Print Preview creates a virtual layout with one frame containing the window. With the focus on a map window or other visual display window we can press File - Print Preview to generate a virtual layout that shows the contents of the window zoomed to fit within a single frame in a layout. The layout appears sized to the default sheet of paper for the default printer. We can change the paper size, orientation and margins by choosing File - Page Setup. A virtual layout means the layout display is temporary, only for the duration it is open after we press File - Print Preview. 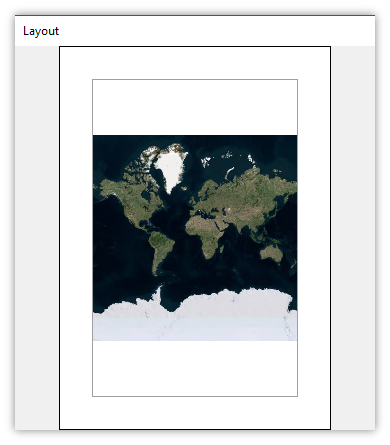 We can use such a virtual layout to print a map without first creating a layout in the project. To save the virtual layout as a permanent layout component in the project, with the focus on the opened virtual layout we choose Edit - Save as Layout and a new layout component will appear in the Project pane. While it is open, the temporary layout created by Print Preview is a fully functional layout with all of the capabilities of layouts discussed in the Layouts topic. It is good we can save the temporary layout as a permanent layout using Edit - Save as Layout because it is very easy to start tinkering with a temporary layout, adding frames and otherwise creating a more sophisticated composition. After investing work into the temporary layout we will want to save it using Edit - Save as Layout. Most imageservers, that is, raster images brought in from a web server such as Bing Satellite or Google Streets, cover the entire Earth. If such an image is zoomed to fit it displays the entire Earth, as in the illustration below at left. 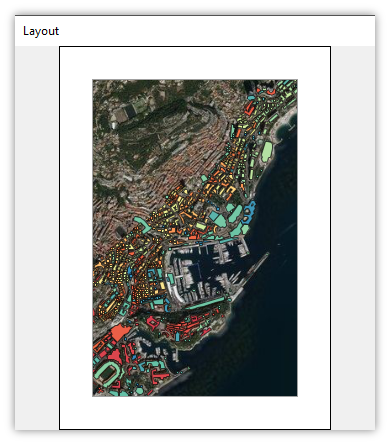 The images above show a Print Preview of a map that contains two layers: a Bing Satellite imageserver layer to provide background context and a drawing layer showing buildings in Monaco. 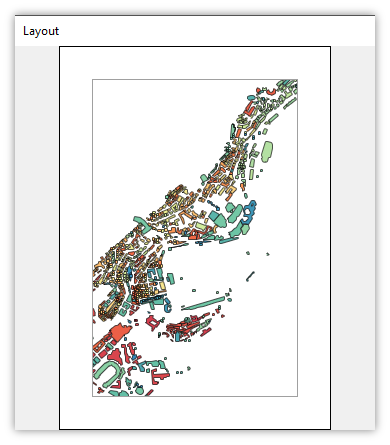 If we create a Print Preview of such a map, the map is shown in a frame within a layout with the map zoomed to fit. However, because a zoom to fit zooms to the extent of the largest layer a zoom to fit using that map will zoom to the entire Earth as seen in the illustration at left above. It is likely that Manifold versions in the near future will evolve more automatic zoom behaviors for dealing with maps that contain imageservers as layers, for example, zooming to fit to the largest layer that does not cover the extents of the entire Earth. Manifold Viewer is read only, viewing software. The File - Print menu command is not available in Viewer.